Why is dad so hard to buy for? I’m not sure whether it’s men in general or just my dad and hubby, but buying for the men in my life has always been a challenge. 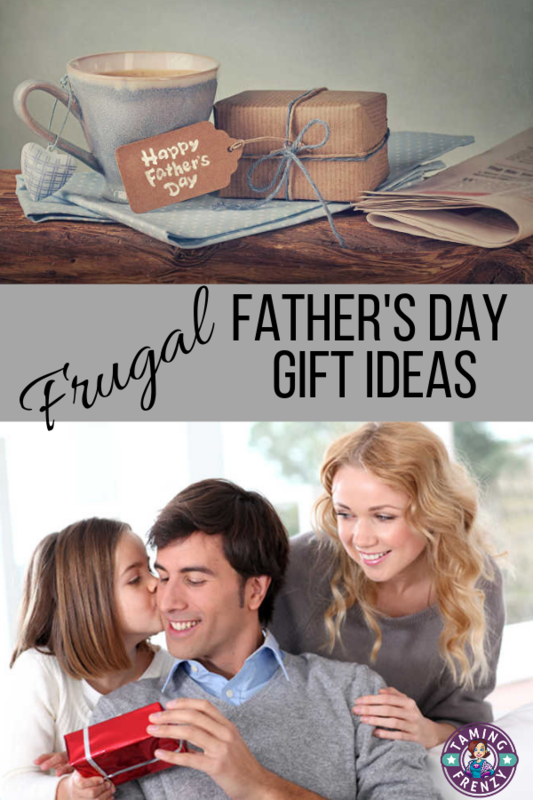 If you’re frequently perplexed as to what to get for the special dad in your life, here are a few inexpensive Father’s Day gift ideas. I don’t know about your dad, but whenever I ask my dad what he’d like for Father’s Day I always get the same response. “I don’t need a thing.” Sound familiar? He’s always been this way. When I was younger I’m sure he didn’t want to burden his college-aged daughter and when I was older I know he was always thinking that our responsibility was to our own kids and that he was fine. It’s always made buying gifts for like doing detective work than shopping. Now my mother always had a list she could hand you of stuff she’d like. So shopping for her was never a problem. And I’m sure the fact that she was also a woman and liked the kinds of things that I liked just made it even easier. But shopping for dad – not so easy. But that doesn’t mean that I don’t want to get him something. So what are some ideas that most men will enjoy that won’t break the bank? Anything for his car or pickup. My dad is a real car buff. He enjoys spending time washing the car, cleaning it out, and generally babying his baby (the car – not me). Maybe a new chamois or squeegee would hit the spot for your car lover. If those aren’t needed, wipes for the dashboard and interior or new car air fresheners are nice. After all, they eventually run out and he’ll need more for the next occasion! 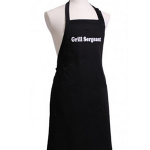 BBQ Equipment – for the man who enjoys cooking when danger is involved. What is it about men that they find outdoor cooking and grilling to be so much fun when the same man can hardly even find the kitchen? Whatever the reason, if your dad is an outdoor cook it’s probably time to replace some tools or to introduce him to some new gadgets. Would any mental picture of dad outside grilling be complete without him in his apron? I doubt it. 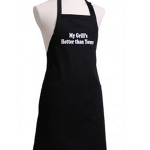 However, finding cute – but manly – aprons for men used to be a challenge. 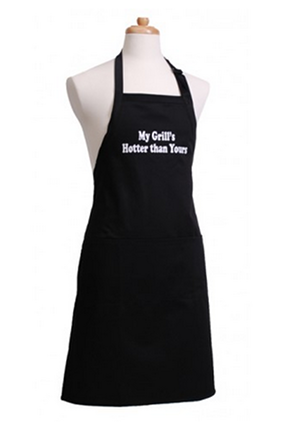 That is until I stumbled upon Flirty Aprons. 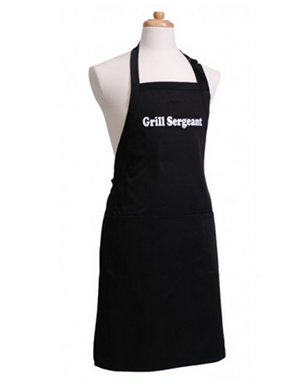 They’ve got aprons for dad, for the kids, and of course for you too! These are just a few of the choices that dad might love: Grill Sergeant, Kiss the Cook, and My Grill’s Hotter Than Yours. 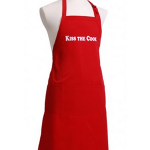 Right now there is one awesome sale going on at Flirty Aprons. 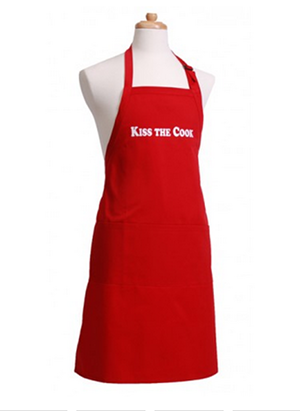 Each of these aprons is only $10.00 which is a steal! Flashlights – Is there a man alive who has too many flashlights? If there is, I’ve never met him. My own husband will admit to having a real love of flashlights and we literally have them all over the house. Having plenty to stash in drawers and in your car is actually a good idea. Whether you live in an area where power outages are common or where storms occur this time of year, having a flashlight within easy reach can be a lifesaver. We tend to throw these in our shopping cart whenever we find the cheap ones that are bright LED lights. We frequently find them for $1 at our area Humongo-mart. Paperback books – Even if your dad is a big reader and you’re not comfortable picking out something he’d enjoy that he hasn’t already read, a gift card will allow him to make his own choices. And for the father who may not be comfortable shopping online, perhaps a session with you at the computer walking him through how to use Amazon and it’s filters will open him up to a selection of books and/or authors he might enjoy trying. Who knows, a shopping lesson from you might be fun on its own. Maybe he’ll learn to create wish lists so that in the future you can order something you know will be a definite hit. No doubt your dad has his own special likes and dislikes that will help you pick out just the right thing for his special day. While I believe in a direct approach and like to just ask and be given a list, when ideas aren’t forthcoming, remember to think about his interests and his hobbies to lead you to the perfect gift. Since my own hubby is a fabulous cook he helped me compile a list of gifts for the chef dad, but what other suggestions would you add to this list? Before you go be sure to sign up for the weekly newsletter. You’ll get ideas to help tame your frenzy and offers to make it easier. And I’d love to see you in the private Facebook group. It’s a small group where you can ask questions and get an answer – not one of those groups you’ll get lost in. These are awesome ideas!! Thank you so much for the list! Pinning!